Most households have a few Squashes and Syrups handy in the kitchen, to entertain sudden guests within minutes, without much ado. These drinks, like say a glassful of Kokum Sherbet , can also be lifesavers when you come home tired on a hot day and want some instant refreshment. 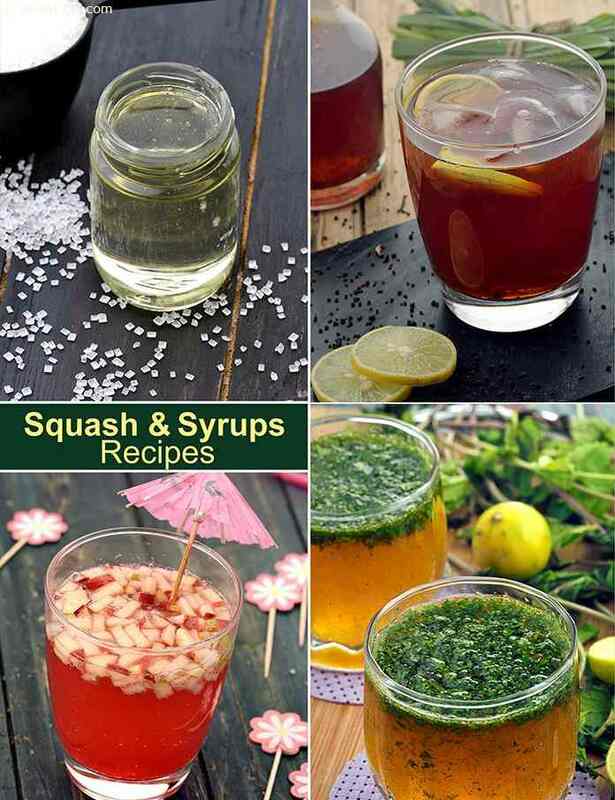 Just take a few tablespoons of the squash or syrup, dilute with water and your favourite drink is ready to relish! Mint is always a great value-add to any citrus flavour, be it orange or lemon. Mint leaves mixed into a tangy orange-flavoured soda makes a totally refreshing drink like this Mint and Orange Drink, which is wonderful to have chilled on a hot summer’s day. So are lemon and khus syrup like the Khus Lime Cup. Lemon squash solar is a thick concentrate of sugar and lime. It is economical as it is prepared under the sun. Mix with water and serve. Cough syrup is a ginger-pepper based sweet cough syrup recipe which can be prepared at home with handy ingredients. A grandma' s recipe to alleviate throat problems, cough syrup is easy to prepare and can be stored in the fridge. A refreshing summer drink, Orange squash is a favorite among children. The concentrated orange flavors in the squash served with chilled water is sure to reenergize you on a hot sultry day. Cardamom and saffron syrup is prepared from cardamom powder, saffron(kesar) and sugar syrup. Store the syrup in the fridge and add to milk or water to get a refreshingly cooling kesar drink or a saffron and cardamom flavoured milkshake.